PayPal is an online payment portal which supports people to make payment, transfer money through the Internet in a very safe and convenient way. PayPal, known as a form of intermediary, is directly connected to your bank account to make the transaction. 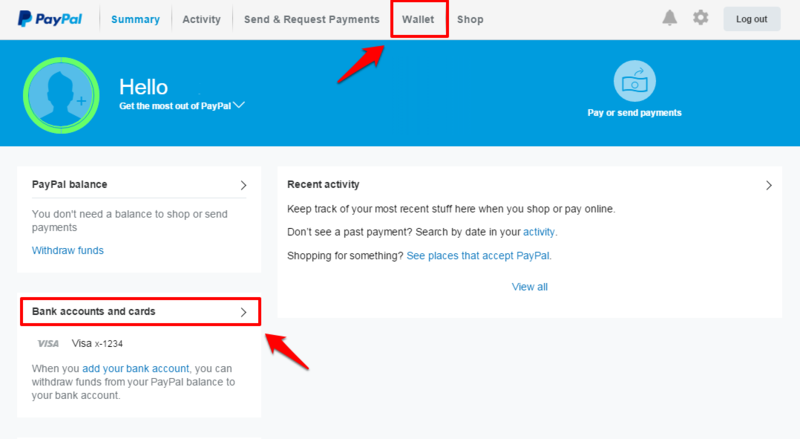 Having a Paypal account, you can transfer your money to it and make online payment or receive money from foreign companies and pay it in bank account easily. If you usually make online payment, you’d better create a Paypal account. Update: I’ve updated the content of this article according to new Paypal interface. High level of security, limited release of card information (no need to enter the Visa / Master per transaction). You can get back your money after having transferred it to a swindle account with Chargeback function. 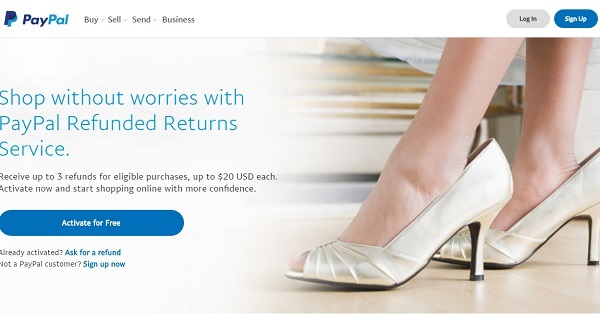 Refund after 60 days if you are not satisfied with the service when using Paypal. PayPal is now widely used, so it is very convenient for online payment. Most companies in the world are now required to verify Visa / Master information originating in Some countries by taking a picture of these cards and send it to them, which is quite time-consuming. However, you will not encounter this problem when using Paypal. – Having international payment cards (Visa / MasterCard). Step 1: Visit the PayPal home page (here), press Sign up button (the green one) at the upper of the right corner. Used mainly for individuals for online shopping; the limitation of receive and send money is $ 500 / month; it is not able to directly pay money from your card into your PayPal account; Low account limit rate. >> So choose this type of transaction if you don’t make online payment usually. Also, after registration, you upgrade to the Premier, there are no limits at all. Distinguish types of PayPal account here. For companies, organizations, groups and individuals with large number of transfers; not limited how much money you receive and send; can log into PayPal account from many different IPs; High rate of limiting account. For example, you select Buy with PayPal, click Get Started to continue. Step 3: Fill in information like: your country, email address, choose your password then click Continue. Step 4: Continue to fill in personal information: name, address, your phone number, tick the Agree with the terms of conditions of using Paypal below the phone number box. Click Agree and Create Account. 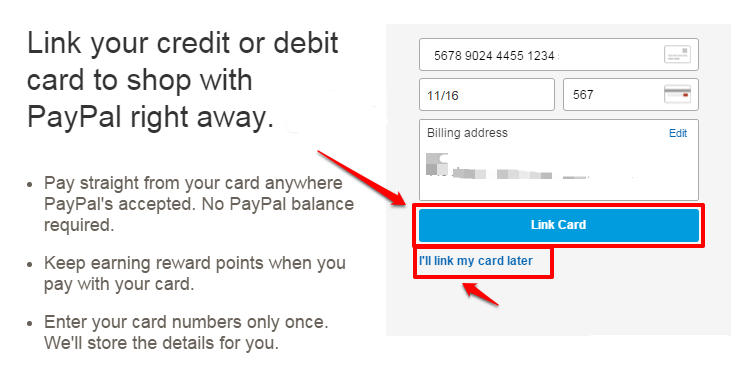 Step 5: Link your PayPal account with one international payment card that you are having or may leave to add it later. 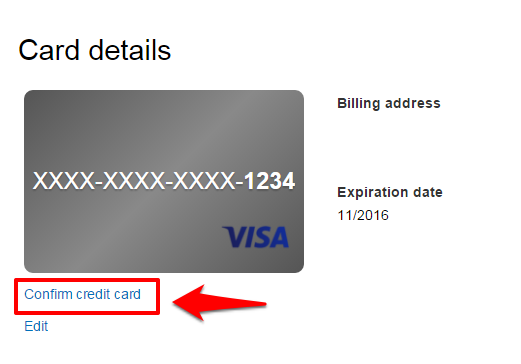 However, if you fill out all card information, you will be able to use your account immediately. 16 numbers printed on the card. 3 security numbers on the back of the card. After filling in, press Link Card. If you do not have a card, select the button I’ll tag my links later to fill in later. Step 6: After linking international payment card with your PayPal account, your registration process is completed. Earlier PayPal has deducted $ 1 in your account to confirm. Don’t worry, just a few minutes later, after confirming the account, you will be refunded immediately. Step 7: Now, PayPal will send you a welcome email including links to verify. Click on Yes, it is my email and enter the password you’ve chosen at Step 3 to verify your account. After hitting Confirm email address, the registration and verification is successful. Paypal will take you back to the home page. Step 1: In the My Account page you will see the interface as picture above, go to the Wallet or hit Bank accounts and cards to enter card account management page to begin the process of verification. 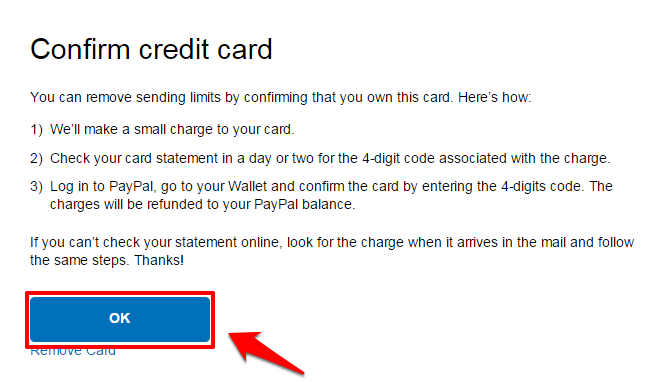 Step 2: Select the card which you want to link with your Paypal account. Hit Confirm credit card. Step 3: The next popup box will be notified by PayPal with the contents note: when clicking OK, PayPal will take you back to the Wallet page, waiting for 4 numbers of secret code to confirm. This secret code will be sent in the description of the payment transaction. At the same time, they will deduct $ 1.95 in your account (card that you have previously registered to link with your account) and this will be refunded within 2-3 weeks from when your account is confirmed (verified). Step 4: Once your account is deducted, check the Internet Banking to take statements or check SMS notifications from banks that deducts the money, the confirmation code in the transaction description. If you do not register Internet Banking or the notification you received includes no code, call the switchboard of the bank that issue credit card and ask for PayPal confirmation number, they will give it to you. The number of 24/7 support is printed right on the card, you can call at any time. Step 5: In Wallet, click on the card, choose Confirm credit card as Step 2. Congratulations! Your process of creating and verifying Paypal account is successful! 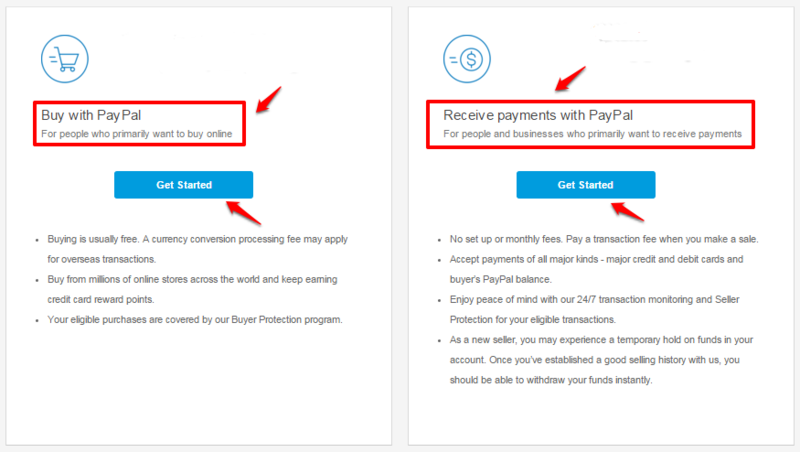 From now on, when making the international payment, you simply select the PayPal, enter your email address and password, and then the money will be automatically deducted from your bank account via Visa / MasterCard (if PayPal balance is not enough). Extremely safe. These two accounts must be different account types (for example 1 Premier, 1 Personal). 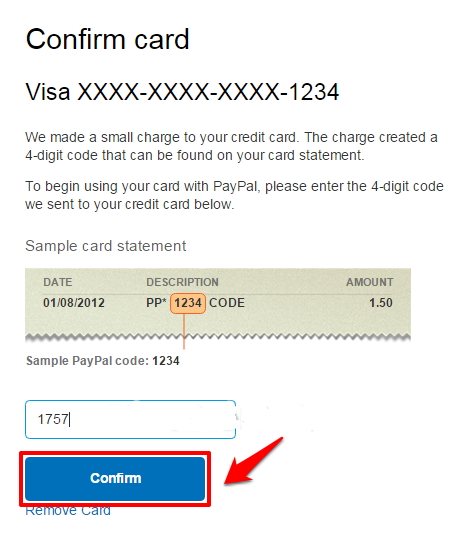 You must use 2 different payment cards when registering these PayPal accounts. If PayPal is detected, your account will be limited, the worst case is that all of your accounts are limited.